1 photograph : b&w print ; 7" x 5"
Photograph depicts (l-r) Judy Mandleman and Sandy Chernoff holding a plaque. The banner in background reads: "Canadian Hadassah-WIZO. [33rd] National Convention." Caption "A Job Well Done. 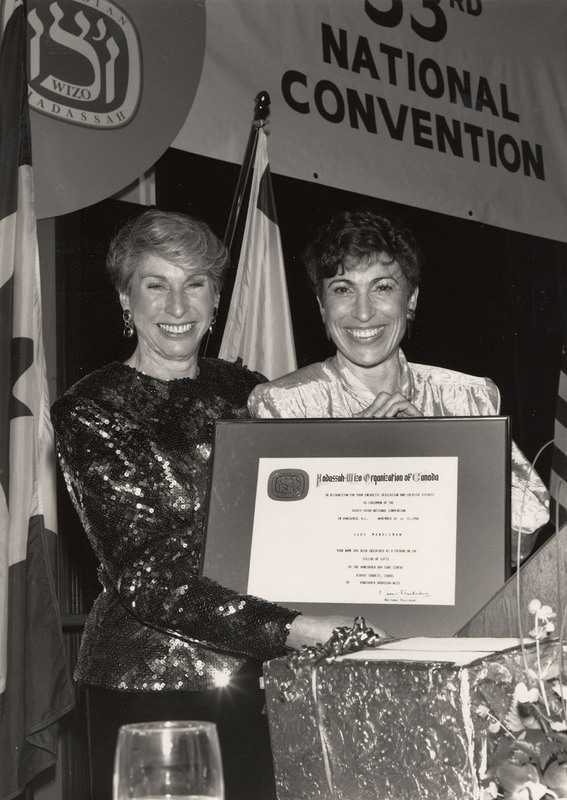 Judy Mandleman (left) receives a plaque from Sandy Chernoff, president of Vancouver Hadassah-WIZO Council for her work as chairman of the Hadassah-WIZO national convention held here Nov. 18 to 21. The plaque names Mandleman as a patron on the pillar of gifts at the Vancouver day care center in Kirat Sharrett, Israel."